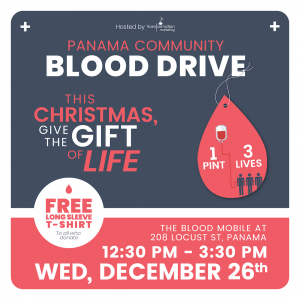 Did you know that less than half of blood drives that take place in December meet their donation goal? Unfortunately, it’s true. Despite this fact, however, and the fact that we hosted ours the day after Christmas, Transformation Marketing still met our Holiday Blood Drive goal of 18 units! We also had 5 first-time donors step up to the plate and give the gift of life during the holiday season. To help accomplish this we accompanied informational fliers with a big online marketing push to ensure area residents were aware of the event. We want to extend a big thank you to our community, those who helped out, the donors, and the Nebraska Blood Bank for coming out and helping to make this blood drive a success. And stay tuned, too, we plan to host another blood drive in the future, so keep an eye out for more information!